Just before Christmas I had my previous set of hair extensions removed and a new set applied. The last set I had in lasted me 5 months, now… I will say found in the last 2 or 3 weeks or so they badly needed to be done and had reached the end of the road, but mostly mine last 5 months. It all depends on 1) how you look after them and 2) how fast your own hair grows. Some people will get longer and some will get shorter time. I have only ever had Gold Fever Hair Extensions so when I talk about hair extensions in this blog post I am ONLY referring to that brand, I can’t comment on other brands as I just don’t know what they are like. This is the only brand I have tried, I love them and don’t intend to change that now. 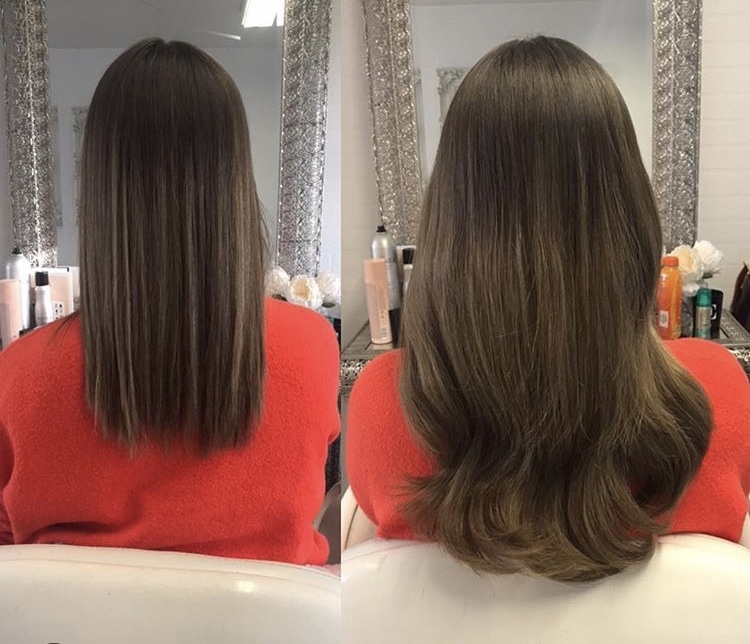 I get asked a lot of the same questions when it comes to hair extensions so I thought an updated blog post of FAQ’s was the best way to approach this blog, and the most informative I think. Choosing to get hair extensions is a big decision and a big investment so you need to do your research. I have always wanted hair extensions and have been wearing them now for almost 3 years now, and I am totally hooked, but don’t get them in a whim, you need to know the brand and know the person applying them and their experience. Choose a reputable salon and go to someone with specific experience in hair extensions. 1. What type of hair extensions do you have? I have Gold Fever Hair Extensions. I have been getting them for 3 years and are the only brand I would recommend as they are the only brand I have experience with. 2. Where did you have them done? I had my new set applied by Edel Hunter. Edel is a hair extensions specialist. She has 11 years experience with Hair Extensions and is a Gold Fever educator and trainer so this lady knows her stuff! She did my hair extensions once before and they were excellent. She has since launched her own business and salon and is based in Greystones in Wicklow. She is really hard to get in to and you need to book far in advance but she is the business! So knowledgable about extensions and so fast. I can’t recommend her enough. I was thrilled to support Edel in her new venture and get my new set applied with her this time. I recommend you have at look at her awesome Instagram page and se for yourself. Ok so this is a hard one to answer because there are a lot of factors; 1) the salon you go to 2) how many extensions you want (i.e. is it for volume only or length too) 3) it depends your own hair. I think 99% of places do free consultations, so you you should always get a consultation first. See the Gold Fever website to see a list of accredited salons. As a guiding point, for some volume only, (so only a few extensions on the sides only) prices would start from €250/ €300, and prices go all the way up to €600 + Everyone is going be different, and depends really on how many you need so use this price as a guide figure only. I have a full head applied (circa 5 packets), again this is very specific to my own hair. 4. Why do you get them done? My own hair is just above shoulder length, I get extensions mainly to add body and volume and a small bit of length. I had 14 inch Gold Fever extensions applied. My own hair is desperately lank and straight and impossible to style, where as the extensions hold a curl or a wave so well, my own hair I could never curl! I tried for years to grow my hair and could never get past shoulder length, it always just looked bitty and broken past that. I have to say though, hair extensions are addictive, once you start and get used to having lots of hair, it’s so hard to go back to your own hair!!! Again, everyone is going to be slightly different, and some people may get longer out of theirs than others, It depends on how well you look after them plus other factors like your own hair condition, how fast your own hair grows etc. On average a full set would last 5 months for me. 6. What shampoo/ conditioner do you use? 7. Do you need a special brush? I use a soft bristle brush so it does not pull on the bonds. Be gently when brushing through your hair, particularly around the scalp! 8. Are they hard to manage and style? How I style mine? I tend to blast them dry first, just occasionally brushing through, if i want them straight i will then sectionals and blow-dry properly or use a straighteners. If I want them curly, I use a wand and pin the curls while warm. if I want a loose, natural wave, which is the style i wear most, then I use the Instyler. If you don’t look after them and brush through regularly, yes they will matt. In the numerous sets I have had over the past few years, I only ever had matting once and it was on the side of the my head I slept on. If you brush through them a lot and wear in a very loose pint in bed they will not matt. 10. Do they suit every hair colour? Yes, if you go to the right person, they will match your hair 100%. Mine is crated using a blend of 3 different shades. This is why your consultation is so important. 11. Are the bonds big? No, they are small. When you get them in the first time, it will feel weird. But you get used to that very quickly, and to be honest, I am so used to the bonds now I don’t even notice. As for my hubby, he can never tell whether I have extensions in or not, I always try and trick me, and have realised, he actually doesn’t see the difference! Men!! The bond is so small you don’t see it when you tie your hair up in a pony tail or wearing an up style. You may find your first application a little sore, marginally tender the first night but that should pass. A good hair extensions specialist WILL NOT leave you with a sore head, in fact, this time around when Edel done my extension, I didn’t feel ANY tenderness whatsoever. Edel told me you should never feel sore or uncomfortable, if you do say it to your hairdresser ASAP. 13. Do you recommend the Instyler? I get asked this question all the time! There is a knack to using the Instyler, once you get that, you are flying! I had it for ages and was using it wrong but once you learn the correct way to do it, you will love it as much as me. I will be doing a video tutorial on how I use it very soon so stay tuned for that. 14. Do they fall out? Towards the very end, say after 4 or so months yes, the odd one may fall put while you are blow drying it or brushing it, that is normal. But they won’t just randomly fall out, unless they are really being pulled at. 15. Can you have extensions in during pregnancy? Yes, 100% you can wear Gold Fever Hair extensions during pregnancy. I am pregnant for the 2nd time around and wearing extensions again this time. 16. How long does application take? Again, this will depend on your stylist, but on average allow at least 3 hours. **Please note: This is NOT an ad, I was not paid to write this blog post and the opinions expressed are my own personal views and experience. Edel Hunter applied my hair extensions complementary. Thanks for the info. I’m seriously considering them for a tiny bit more length and more volume. I usually wash and blow dry my hair every morning before work because my roots get greasy and hair is a mess when I wake up. Sounds like you are saying that I couldn’t wash my hair every day? Great thanks. Maybe I’ll try the dry shampoo first to make sure I can get away with it.